I wrote three comprehensive Heritage Management Plans and produced three brochures to highlight the cultural and natural heritage of Kampot, Kep and Koh Kong, Cambodia. Very little is known about the heritage and significance of some of these buildings and a dearth of information is available to tourists, particularly in English. By generating awareness and education about valuable heritage sites among international and domestic tourists, it is hoped that local people will also begin to value, appreciate and preserve these sites from the French Protectorate-era, Chinese shophouses from the early 20th Century, and 1950s-60s New Khmer Architecture. 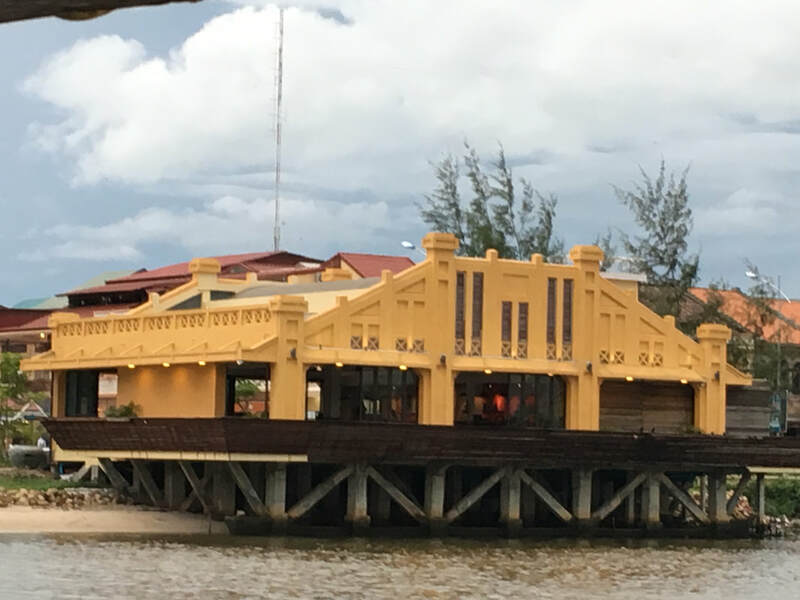 Excellent example of adaptive re-use of a 1960s New Khmer Architecture building that is now a high-end restaurant in Kampot. Dilapidated Chinese shophouses in dire need of restoration. Kampot town is filled with these shophouses and it is not necessarily the individual shophouse but the "sum of the individual parts" that gives the town its quaintness and charm that cannot be replicated with modern structures. 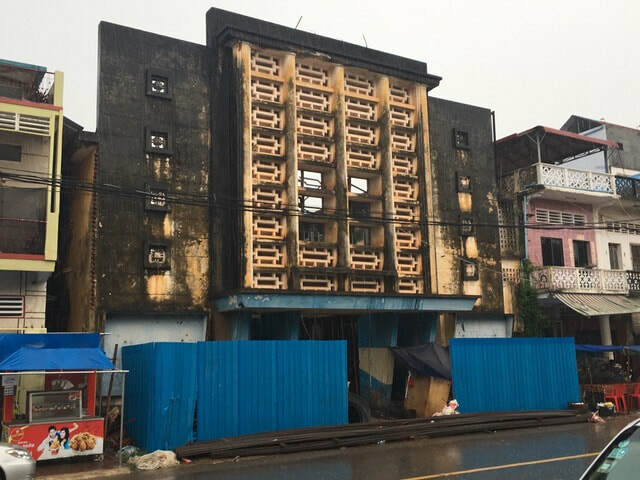 An iconic cinema (circa 1950s) in Kampot Town has been completely demolished except for the facade. This is called "facadism" and is said to be like "a face with no eyes." It is important that the interiors of buildings also remain intact. Sadly, Cambodian people do not see nor appreciate the architectural beauty that is all around them in Kampot town. Here, a formerly beautiful building is filled in with cement and laundry is placed out in front to dry. An excellent example of adaptive re-use. In the 1950s and 60s, Kep was the hottest vacation spot for the King and wealthy French before the Khmer Rouge took over - and killed whoever was left and destroyed the place because of their hatred of the wealthy, This 1950s era villa is one of few that has been rescued and renovated by a Belgian hotelier, who thankfully has an appreciation of architecture and a vision for its modern day use. 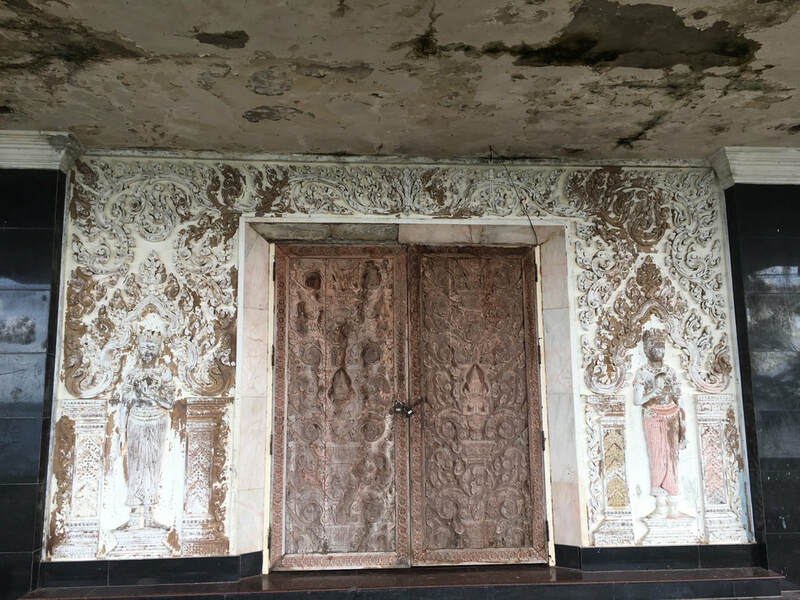 Many old and abandoned villas are privately owned by wealthy Cambodians - and are sadly most likely headed for the wrecking ball unless they can be convinced otherwise. Current site interpretation for Phnom Sorsia outside of Kep is written haphazardly on a cracked wall near the site's entrance. The Queen's Villa in Kep is most likely dilapidated beyond repair. It was a hideout for Khmer Rouge forces in the 1970s that deliberately destroyed anything owned by the Royal Family. It is currently a nursery where people can purchase garden plants. In Koh Kong, a former King's Residence has been abandoned and recently became part of the Bopha Hospital system. It is hoped that renovations - and not demolition - will take place here in the future.